Growing up, I learned to conform to a fictional self, the expected roles my family and friends expected of me. When my dad deserted my mom, and four kids, leaving me as the eldest child, I got to experience welfare in Spokane Washington. The welfare caseworker would come to our home, look through my chester drawers. I recall when I was 15, she found a ‘transistor radio’ worth about $5 in my drawer, and said, ‘this will have to be reported, and deducted from your welfare payment!’ By age 17, I had moved out, and gone on my own, changing tires at Montgomery Wards, working for a few dollars an hour, but paying for my own car and apartment. I wanted to get out from under the ‘fictional self’ of welfare kid. I did not like lining up to get the industrial cheese, the tubs of lard, but did like making those cheese sandwiches on the stove. By the time I graduated high school I had a rep (reputation) as a bad boy, as someone apt to get into trouble. With the legal age for ‘beer’ set at 21, there was plenty of opportunity for trouble to find me. And this to is a kind of ‘fictional self.’ In my high school (Shadle Park), none of us were expected to go to the major universities, like Gonzaga, that was for people who went to Prep Schools. Rather, we were expected to be a mechanic, or go to community college, and drop out after a semester. It was the time of the draft, and they drafted kids who were not in college, or the bad boys, and I was guilty on both counts. In the Army, in Basic Training, I learned a fictional self, as the drill sergeants had me yell ‘kill, kill, kill!’ as I stabbed a bayonet into a straw dummy, crawled on my belly beneath the barbed wire, and the machine gun bullets. I was conflicted, trying to play the bad boy role, and having the Army try to shape me into the soldier role. I finally surrendered, began blousing my trousers, pressing my fatigues, showing up on time, etc. I was made a supply clerk, then a company clerk, and promoted to E5 (Spec 5, a sort of Sergeant). I was kind of like the character Radar in the movie Mash. As a Veteran I was encouraged to adopt a ‘fictional self’ and this made it more difficult after deployment to Vietnam to find my authentic Self. I really had no idea what my ‘authentic Self’ was, and my quest is to find it. I like (Heidegger, 1963) Being and Time. It is all about the search to find the authentic Self by throwing off the many fictional selves that a society, military, school, family, and friends lay on you. Eigentlichen Selbst, your ‘authentic Self’ (uneigentlichen is inauthentic). “Proximally and for the most part the Self is lost in the ‘they'” (Heidegger, 1963, # 383). “The ‘who’ is the neuter, the ‘they’ [das Man]” (Heidegger, 1963, # 127). “If everything ‘good’ is a heritage, and the character of ‘goodness’ lies in making authentic existence possible, then the handing down of a heritage constitutes itself in resoluteness”(Heidegger, 1963, # 384). This anticipatory resoluteness to shake of the fictional selves, and find one’s ownmost potentiality-for-Being-authentic-Self is something I am still working on. Yesterday I wrote about the ways American Psychological Association in its DSM manuals tries to develop a fictional self, called PTSD. 2.Recurrent distressing dreams in which the content and/or affect of the dream are related to the traumatic event. 4.Intense or prolonged psychological distress at exposure to internal or external cues that symbolize or resemble an aspect of the traumatic event(s). 5.Marked physiological reaction to external or internal cues that symbolize or resemble an aspect of the traumatic event(s). 1.Avoidance of or efforts to avoid distressing memories, thoughts, or feelings about or closely associated with the traumatic event(s). 2.Avoidance of or efforts to avoid external reminders (people, places, conversations, activities, objects, situations) that arouse distressing, memories, thoughts, or feelings about or closely associated with the traumatic event(s). 1.Inability to remember an important aspect of the traumatic event(s) (typically due to dissociative amnesia and not to other factors such as head injury, alcohol or drugs). 2.Persistent and exaggerated negative beliefs or expectations about oneself, others, or the world (e.g., “I am bad,” “No one can be trusted,” “The world is completely dangerous,” “My whole nervous system is permanently ruined”). 3.Persistent, distorted cognitions about the cause or consequences of the traumatic event(s) that leads the individual to blame himself/herself or others. 4.Persistent negative emotional state (e.g., fear, horror, anger, guilt, or shame). 5.Marked diminished interest or participation in significant activities. 7.Persistent inability to experience positive emotions (e.g., happiness, satisfaction, or loving feelings). 1.Irritable behavior and angry outbursts (with little or no provocation) typically expressed as verbal or physical aggression toward people or objects. 6.Sleep disturbance (e.g. problems falling or staying asleep or restless sleep). You can play this PowerPoint which will explain the Criterion and give examples. Keep in mind, that you can have a high score on the DSM-V PTSD instrument, and be totally denied any and all VA claims and benefits. The VA rating specialist will ask you for your DD-214, and see if you were awarded the Combat Infantryman Badge (CIB), Combat Action Ribbon, Medal of Honor, Purple Heart, or some other validating medal, in–order-to determine you were in an encounter with enemy fire, and you behaved as the military expected. You can also do a 201 Claims File: “plane crashes, ship sinkings, explosions, rapes or assaults, duty on a burn ward or graves registration unit, and acceptable POW status” (source). “The Vietnam Service Medal is not among those decorations considered conclusive proof of the stressor” (IBID.). 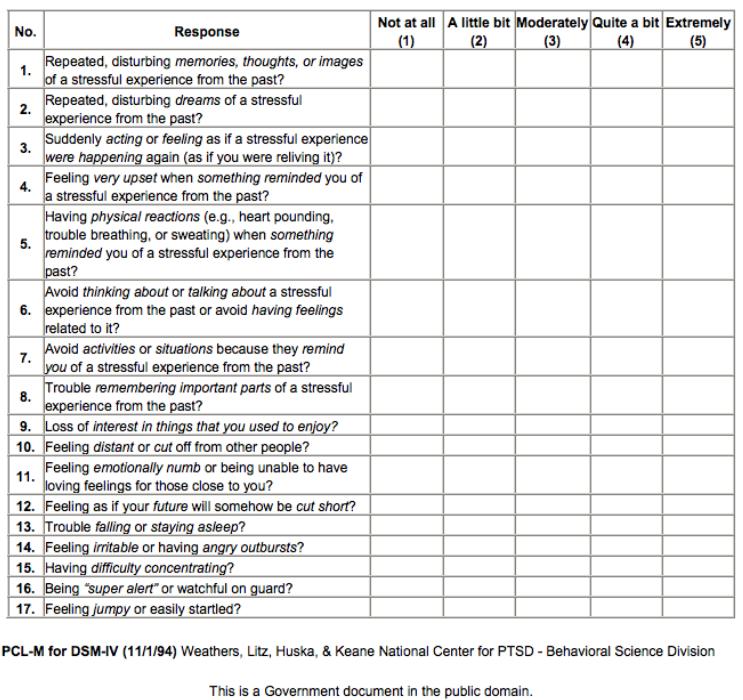 The quest for the veteran to find their authentic self is not something the VA rating specialist can help with. You won’t find it at the VA office. When I served in Vietnam, earned the Vietnam Service Medal, the National Defense Service Medal, the Vietnam Campaign Medial, 2 OS Bars, Marksman M16, Sharpshooter M14 — the medals do not translate into anything substantive. Yet there are repeated stressful dreams, a sudden reaction to a movement behind me, a feeling I need to get out of a crowded restaurant, feeling irritable, easily startled, and so on. This is the PTSD anxiety, an attunement to Being-in-the-world that comes from a fictional self that keeps overshadowing my authentic Self. PTSD is the ultimate ‘they-self- (Das Man), its so unspecific, there is no answerability in it. It covers up the authentic Self. The authentic Self is grounded in existence, in a heart-of-care kind of Being-in-the-world.